GOT MILK? TIMANTTI is a fun doe that we have high hopes for. We are very fortunate to have her as we nearly lost her dam when she was born in an awful, ketotic kidding. She ended-up being our best 2014 doe kid and was 1st place at the Del Mar Fair the only time we showed kids that year (a ringworm break-out prevented us from showing kids the rest of that year). 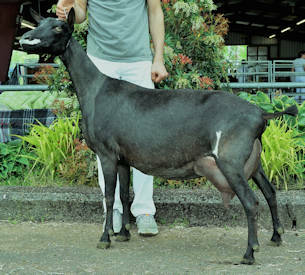 She has a very clean, feminine bone-pattern and went through an unusual dry yearling growth period that despite the National Show being close, we left her at home. 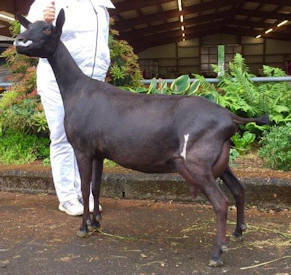 Her general appearance came together by the fall where she placed 2nd at the Washington State Fair in September. She freshened in 2016 with a beautiful udder in all technical aspects (ideal medial strength & teat placement) and the lateral extension forward as seen in her flank is as good as CHRYSTIN or CHRYSOCOLLA's...and that's saying a lot! She had a very good initial linear appraisal evaluation; however, her trait breakdowns in both linear traits & structural traits indicate a doe with a higher final score than she was given...she was E or V in EVERY structural trait including feet. So we waited for next year's appraisal session and it has improved each year...guess I was impatient in 2016. MANTTI ended the 2016 season 1st/1st udder 2 yr-old over excellent competition at the Washington State Fair. We are excited to see this cross mature as we plan to use her sire more often as an alternative to X-RATED on our FREELANCE daughters in the future. 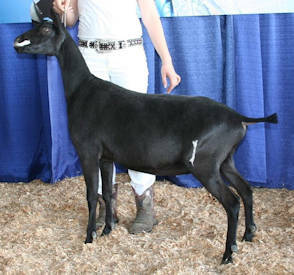 Her 2016 doe kid sired by ACCOLADE was junior champion at the South Dakota State Fair, owned by Kerry Post. Her 2017 show season was a great one, finishing at her first show including a Best in Show title, placing 10th at the ADGA National Show and pairing with her dam to with the Dam & Daughter group class! She followed that up with a Reserve Senior Championship at the Minnesota State Fair where she was a part of our Supreme Dairy Herd in Show! Her 2017 daughter by ANDRETTI is one of our favorites of the year and we look forward to another AI daughter from YUKON JACK to keep for 2019, although her son could be yours! Preordered Kids: $1000 each, first doe will be retained...maybe all since we didn't get one in 2018! © 2009-2018, Olentangy Alpines-Mark V. Baden Enterprises. All rights reserved.